Our Tahoe treasure is a traditional old Tahoe cabin. Built in the early 1950s, it is built entirely out of wood. Our cabin is rustic but cozy and comfortable. We are nestled in a quaint, wooded neighborhood close to everything Tahoe has to offer. Go to the beach, work out, swim, ice skate at the recreation center, golf or shop, all within walking distance. Enjoy a cup of coffee or a sip of wine on the spacious deck and enjoy the beautiful outdoors. This is a one bedroom cabin with an open loft upstairs. The downstairs bedroom has a full size bed and the large loft has a full size bed and 3 twin beds. Gas fireplace. Enclosed, no wood can be put into fireplace. Very cute and cozy cabin. My family just loved it! Clean, cute and cozy cabin. Very close to the lake, Heavenly village and nice restaurants. We love the privacy of the cute cabin where our kids can play outside or inside. Thank you Tom & Gwen for sharing your cabin. Nice and cozy cabin in the snow of Lake Tahoe. Special thank you to Tom for being very quick to respond to inquiries and leaving the cabin warm waiting for us after our 10-hr drive. Cabin had everything we needed.Very close to Safeway. I did find myself confused as to where was that patio around the house that you see on this picture; well... it was buried in the snow ::)). I already recommended the cabin to a couple of friends. The only thing that might prevent us from coming again is that from now on we will need to travel with our new addition to the family - a growing golden retriever. Stayed for 5 nights in February, 2019 during one of the more intense snowstorms of the season. Impressive that Tom and Gwen were able to have the cabin cleaned and the driveway plowed prior to my arrival. Services in the Tahoe area were strained at the time with all the new snow! The cabin is as advertised: very clean, (many) comfortable beds, all the cooking utensils and spices you should need and a spacious common area to relax in. Close to the main street but a quiet neighbourhood. I highly recommend this property and the owners were a pleasure to interact with. 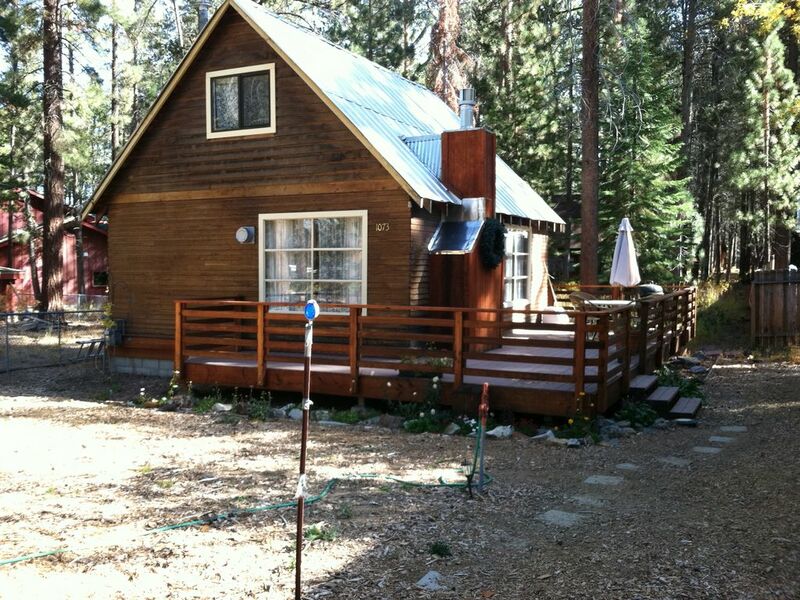 Lovely, Cozy Cabin in the heart of S Tahoe, memorable time for our Christmas vacation! This place surprised us with the quiet neighbor, overall floor plan and interior setting; very convenient supplies for cooking, shower and stay. The cozy warm fireplace and lovely deco make one feel at ease right away. Hosts are very thoughtful, place well maintained. Location super convenient, minutes to free shuttle to Sierra Ski resort. Definitely will recommend this place! My Mama, daughter and I had such a wonderful time in this sweet, homey cabin. It has just enough of everything you need. The downstairs bedroom was perfect for my 81 year old Mama and the loft bedroom upstairs reminded my daughter and I of our summers at camp. The cabin is in a terrific neighborhood close enough to walk to the grocery but still give you the Tahoe feel. We were visiting in October so no snow but we could see how cozy it would be to spend a snowy weekend in this lovely cabin. My daughter's comment , "It feels like our family cabin" . Love, Love, Love this place! Thanks for a fantastic weekend. PS please do heed the instruction regarding the bear proof garbage can. We saw a beautiful big boy bear up the street one evening rummaging in a neighbors non bear proof garbage! Perfect location and has everything we needed.